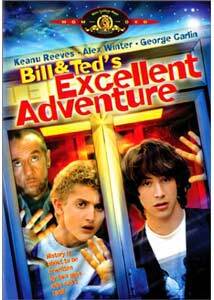 I was 12-years-old the last time I saw Bill and Ted's Excellent Adventure before watching this new DVD. As the credits rolled one thought immediately came to mind: I have grown older and slightly more mature, the film's story has not. Though not a large hit in theaters (it grossed only $40 million) Bill and Ted found an audience on video, and launched the career of a famously wooden superstar Keanu Reeves, and the answer to a trivia question in Alex Winter. No matter how old I get, though, I still find myself getting caught up in this screwball comedy, hopelessly (and guiltily) laughing when I know I just shouldn't be. Because for all of its obvious laughs and sight gags, there is something wholly enjoyable and dare I say "clever" about Bill and Ted. Think of it if you will as History 101 as taught by Bozo the Clown, and hey... that isn't such a bad thing. When you think of it as the grandfather of modern comedies featuring goofs with low IQs out of their natural element, then there is something "historic" about Bill and Ted. Sure we might still have films like Dude, Where's my Car? or Wayne's World without the creation of Bill and Ted, yet these types of characterizations owe something to Ted 'Theodore' Logan and Bill S. Preston Esquire. Without a passing grade on their history class presentation Bill (Winter) and Ted (Reeves) will be forced apart, which most importantly means the break up of their band. This problem is especially difficult for Ted, who will be sent to military school by his father (Lindon) if he does not receive a seemingly impossible A+ for his work on the project. When all seems lost they meet la stranger named Rufus (Carlin) who proclaims the two necessary to the survival of civilization as we know it. It seems that in the future the lifestyle of Bill and Ted, which includes loud music, playing air guitar and acting "most excellent," is universally accepted and if Bill and Ted are split up life in the future, it follows, will cease to exist. Soon by way of a magic phone booth the two are traveling across time to encounter everyone from Joan of Arc to Billy the Kid. Will the two get a passing grade and make life "totally un heinous?" Well, duh dudes. As silly as the plot is, and boy is it, Bill and Ted is a surprisingly enjoyable fish out of water picture that succeeds because it never takes itself seriously. Jokes come often and while some stick, several land with an audible thud. The screenplay by Ed Soloman and Chris Matheson is a light-hearted bending of history, wisely mixing the personalities of our heroes with those of another time. It is admittedly funny to see Socrates quote Days Of Our Lives or to hear Lincoln proclaim "Party On Dudes!" It is because of these types of moments that makes Bill and Ted something more than a dumb teenager movie—a rarity in Hollywood nowadays. As someone who finds Keanu Reeves to be the equivalent of fingernails running down a chalkboard, as Ted the master of "whoa" is surprisingly enjoyable. Maybe it has to do with the fact that this character is essentially what I perceive to be Reeves in real life (aloof and surfer-like). Winter is also enjoyable, though his performance doesn't radiate with the energy that Reeves does. Is Bill and Ted a great movie? Um, no. But it's still an enjoyable romp through history that makes me laugh no matter how many times I see it. Maybe I'm easy to please, but, hey, sometimes that is all it takes. Image Transfer Review: I was shocked to find out that Bill and Ted's Excellent Adventure was filmed at a scope aspect ratio of 2.35:1, but after viewing it on DVD it seems as if the film benefits from the ratio. The same can't be said for the anamorphic transfer. The largest problem here is a large amount of print flaws throughout the duration of the film. Colors and black levels are fine, with a quite a bit of evident grain. Unfortunately flawed. Audio Transfer Review: Presented in only a Dolby Digital 5.1 mix, Bill and Ted contains a largely uneventful soundtrack. Dialogue is the biggest star of the mix, an above average center channel portion sounding clear with little distortion. The remaining speakers are relatively quiet. Extras Review: The film's theatrical trailer is presented in a 1.85:1 aspect ratio. Middling video and audio portions and lack of extra features means this disc belongs in your collection only if you are a fan of the film (read: if you like stupid comedies as much as I do). Others should be satisfied with a rental.